Last week I told you about the Magic Cable Trio, a 3-in-1 USB charge/sync cable with connectors for micro USB, mini USB, and Apple devices (like the iPhone and iPad). I loved the idea, but not the $19.99 price. Thankfully, eagle-eyed reader Russell spotted a much cheaper alternative on eBay: the 3in1 Universal USB Data Cable Adaptor for Apple Android SmartPhone Cell Phone. Not quite as glamorous-sounding as "Magic Cable Trio," I grant you, but ultimately it's the same product: a USB cable with a standard USB plug at one end and three popular connectors at the other: micro USB, mini USB, and Apple iDevice. That means you should be able to sync and/or charge just about any gadget in your bag. 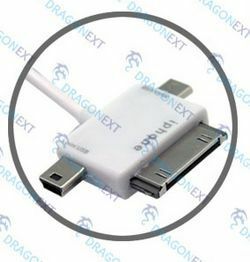 This cable, sold buy Hong Kong-based BossKnow, looks like a Frankenstein version of a standard Apple cable: the mini-USB and micro-USB connectors poke out from either side of the 40-pin iDevice connector. It's definitely not as elegant as the Magic Cable Trio, which uses nested plugs. Thus, if you were interested in the Magic Cable Trio but didn't want to shell out $20, here's your chance to get more or less the same thing for 1/6 the price. I'm sold!